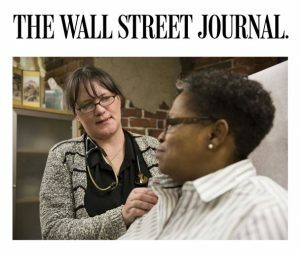 Many thanks to Melinda Beck for doing a great article on Direct Primary Care, focusing on some practices right here in New England, including Wellscape Direct MD! “There’s no waiting room at Linnea Meyer’s tiny primary-care practice in downtown Boston. That’s because there’s rarely a wait to see her. She has only 50 patients to date and often interacts with them by text, phone or email. There’s no office staff because Dr. Meyer doesn’t charge for visits or file insurance claims. Patients pay her a monthly fee—$25 to $125, depending on age—which covers all the primary care they need. Dr. Meyer is part of a small but growing cadre of doctors practicing “direct primary care,” which bypasses insurance and charges patients a monthly membership fee that covers everything from office visits to basic lab tests. It’s similar to “concierge medicine” but less costly: The average monthly fee for direct primary care is $25 to $85, according to the Direct Primary Care Journal, a trade publication. That compares with $100 or more a month for concierge practices—which often charge patients, or their insurers, for individual visits as well. Concierge practices, which can run as high as $25,000 a year, often target affluent baby boomers in high-cost urban areas and may include services such as personalized wellness plans and advanced testing. Direct-primary-care practices run the gamut from small, independent offices like Dr. Meyer’s to multistate networks, with many variations. Some work with employers and insurers, offering unlimited primary care as part of employee-benefit plans. Boston-based Iora Health works with Medicare Advantage plans in Colorado, Arizona and Washington state. Qliance, with six offices in the Seattle area, is working with Medicaid there and is an option on the state health-insurance exchange. Although less than 2% of the nation’s 900,000 licensed physicians are involved in direct primary care to date, proponents say the model could grow as Republicans encourage more free-market alternatives to insurance-based, fee-for-service medicine. Tom Price, the new Health and Human Services secretary, introduced legislation while he was in Congress that called for replacing the Affordable Care Act with tax-credit-funded health savings accounts. Currently, Internal Revenue Service rules prohibit using HSA funds to pay direct-care membership fees, but bills to lift that prohibition have been introduced in both the House and Senate. Doctors in such practices say the steady income from membership fees frees them from having to pack patients into 10-minute visits to make ends meet. They can take more time with those who need it and handle many issues via text or email, which are rarely reimbursed in traditional fee-for-service medicine. Dr. Meyer interviewed on Woman2Woman Today! Wellscape wishes you Happy Holidays! Direct Primary Care is a “Smart Money Move” according to Consumer Reports! *Please do not send any personal medical information by email. Instead, call us.